Build Wider Rounder Cannonball Delts With This Workout! This is aimed at bodybuilders whose delts have stopped growing, or who are stagnated mentally. Get those delts fired up with this great workout. Nothing offsets a good physique like an impressive pair of cannonball deltoids. The problem for most people however is how to go about attaining a pair!! I&apos;ll skip over the anatomy of the deltoid muscle as most bodybuilders will have the general idea about how delts work, and how the muscle has three heads which should all be trained, except for the beginning bodybuilder of course. This article is aimed at intermediate or advanced bodybuilders whose delts have stopped growing, or who are stagnated mentally and would like a fresh approach, or whose delts are responding very slowly to training. First off, let me say that for the most part, you should focus on mass of course, but balance between the deltoid heads is paramount for a nice round balanced proportionate appearance. Too many bodybuilders have big anterior delts from pressing, benching, and doing inclines, etc., and as a result, their development is not in proportion. Here is a routine that I have tested personally, and have also given to lots of my clients at various times. I have yet to see anyone who doesn&apos;t progress from doing it, as long as it is done in the manner as it is written. Adjust the number of sets to fit your level of training, but keep the reps the same as listed below. Do a set of strict Lateral Raises for 10-12 reps followed by a set of Bradford Presses, for 8-10 reps with no rest in between the two exercises, superset style. Rest 45-60 seconds only, add weight, and repeat this procedure for a total of 4 sets each, adding weight and decreasing reps each set. You may want to use a constant poundage on laterals; it&apos;s your choice, but keep them strict, and pull with the side delts; do not swing the bells up using momentum. On your last set, go back to your original starting weight, and go to failure on each exercise, regardless of how many reps you can get which should not be that many at this point in the routine due to the previous work performed, and the short rest periods. The reps are just goals or targets to aim for, but laterals should be a minimum of 10 reps on the heaviest set, and the Bradford Presses should be at 8 minimum at the heaviest point. Doing both exercises with a constant weight, and resting only 30 seconds between supersets is another good way to perform these, especially if you do not feel particularly strong on any given shoulder day. Place a barbell at the shoulders as you would in a normal barbell front press, then press to just the top of the head, then lower it behind the neck, press again just clearing the top of the head and lower to the front again, and repeat until you reach your rep goal; back and forth, front to back, just clearing the crown of the head. 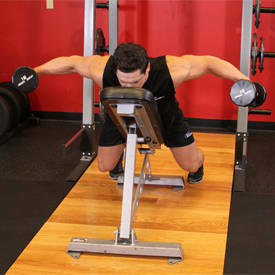 To reiterate, the bar should just be clearing your head... you do not lock out; this non-locking motion keeps continuous tension on the shoulders and doing the laterals before the presses in pre-exhaust superset style without resting between exercises is a foolproof method for increasing intensity, resulting in bigger rounder deltoids. Again, I have trained tons of people over the years, and never once have I seen anyone fail to improve their delts while using this combo. Stand with a dumbbell in each hand, palms facing backward. Your feet should be about shoulder width apart. Maintain a slight bend in your elbows throughout the exercise so that your arms are straight, but not quite locked. Lift the weight in your left hand in front of you in a wide arc until it is slightly higher than shoulder height. 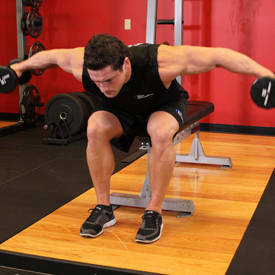 With a smooth, controlled motion, lower the weight while simutaneously lifting the weight in your right hand, so that both arms are in motion at the same time Do three sets at 10-15 reps.
Now we move onto the often neglected rear delts. I do around six sets total, a superset consisting of Bent-Over DB Laterals, or Incline Rear Delt Raises. Again this is your choice, coupled with Face-Pulls, also for 3 total sets, no rest between exercises, and only 45-60 seconds rest between supersets. Grab a high pulley that is attached to one side of a cable crossover unit and pull to the face while keeping the elbows wide. This really targets the rear delts. Lie face down on a 30 to 45 degree incline bench holding 2 moderately weighted dumbbells. With thumbs facing each other, do a bent-over lateral while lying on the incline. There ya go, nothing fancy or scientific, just a very result producing routine!! Give it a shot, and possibly, just possibly now, you may have to turn sideways to enter a room because you got so W-I-D-E!!!! This routine works well and you can thank me later for the cannonballs that you created! !